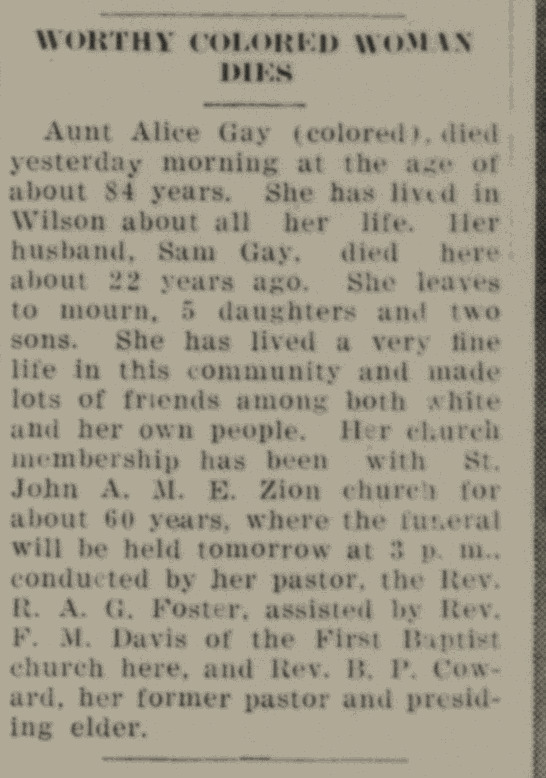 Obituary of Alice Bryant Gay. Wilson Daily Times, 25 October 1938. Sam Gay, son of Amos Thigpen and Harriet Gay, married Alice Bryant, daughter of Louisa Bryant, on 10 February 1870 in Wilson. P.E. Hines performed the ceremony. In the 1870 census of Wilson, Wilson County: Samuel Gay, 24, wife Alice, 20, and brother Albert, 21. In the 1880 census of Wilson, Wilson County: farm worker Samuel Gay, 27, wife Allice, 25, and children Blanch, 8, Louizah, 7, Edgar, 4, Charlie, 3, and Mamie, 1 month. In the 1900 census of Wilson, Wilson County: farmer Sam Gay, 54; wife Alice, 50; and children Charlie C., 23, Edgar B., 25, Lucy, 17, Samuel, 14, Albert and Beatrice, 10, and Lily, 4. In the 1910 census of Wilson, Wilson County: Samuel Gay, 65, wife Alice, 55, and children Albert, 20, and Lilly, 15. In the 1920 census of Wilson, Wilson County: widow Alice Gay, 45; daughter Beatrice, 26; grandson Jerome Wood, 11; granddaughter Gereddine, 10; son Albert, 30; daughter-in-law Anabell, 24; grandsons Albert Jr., 4, and Jesse, 2; son-in-law Fredrick Bolling, 35; daughter Lillie, 23; and grandchildren Delma, 4, and Fredrick, 2. In the 1930 census of Wilson, Wilson County: at 623 Green, widow Annie B. Gay, 30, a laundress; husband Albert, 40, a bellboy; mother-in-law Alic, 73; and children Albert Jr., 14, Jessie, 11, Hal, 8, Samual, 6, Mirrian, 4, and Ralph, 2. Alice Bryant Gay died 24 October 1938 in Wilson. Per her death certificate: she was born 1 January 1854 in Wilson County to Lousie Bryant of Goldsboro, North Carolina; was a widow; and resided at 402 North Reid Street, Wilson. Lucy Lewis of Newark, New Jersey, was informant.